Phoenix is ready to get his paws on the nose! 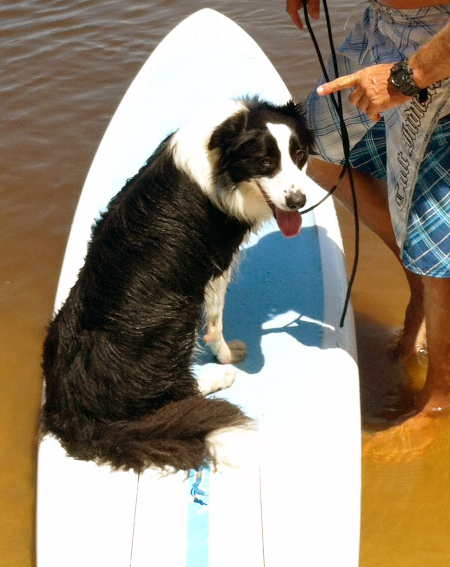 A free Surfing Dog Clinic is set to take place this Sunday, March 10th at 9:00am at the Noosa Spit and will give any potential surf dogs the chance to hit the water and get their paws wet under the guidance of Natural Balance dog trainer, Chris De Aboitiz. Chris De Aboitiz has been hitting the waves with his surf dog Lani for years and believes it is one of the best ways to bond with your pet, encouraging all pet owners to give it a try. "I get all my pack of dogs in the water on different occasions, especially Lani, she loves hitting the water and it's such a great way for me to really bond and have some fun with them all," he said. Lani and Chris stole the show at the 2012 VetShopAustralia.com.au Surfing Dog Spectacular and have recently been in training for preparation of this year's event, which will showcase the same day on March the 10th at 4:30pm as part of the Noosa Festival of Surfing's opening ceremony. "We can't wait to take part in the event this year and hopefully the clinic will inspire people to give dog surfing a go, as it really is a fun way to keep fit with pets,"
"Every opportunity to spend time with their owners is a fun experience for pets. Whether that is getting wet at the beach or going for a walk, the bond between pet and owner is strengthened by keeping active and spending time together." Olympic Gold Medallist and A-team Ambassador, Giaan Rooney, was a star guest at last year's surfing dog event and was thrilled with the surfing dog concept, explaining it was a perfect example of fun and fitness with pets. Chris has advised that people who can already surf will have the most luck at the clinic, however for anybody who wants to see their dog surf and doesn’t have the skills to match; Chris will be on hand to take them out on the board himself. Everybody is welcome to attend and anybody who is interested should come along to the Noosa Spit just before 9:00am on Sunday, bring your dog, a surfboard and get ready to get the doggy paddling underway. It has also been confirmed that Celebrity Vet, Dr Harry will be coming along to try his hand at some dog surfing!